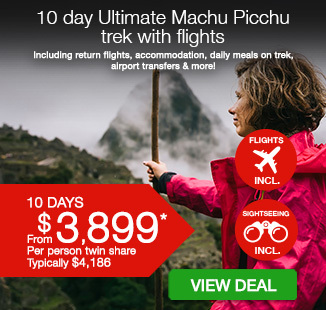 17 day Ultimate Patagonia with return flights, daily meals, accommodation, airport transfers & more! Will definitely make another booking with Webjet in the future. Customer service and quality of holiday offered were excellent. 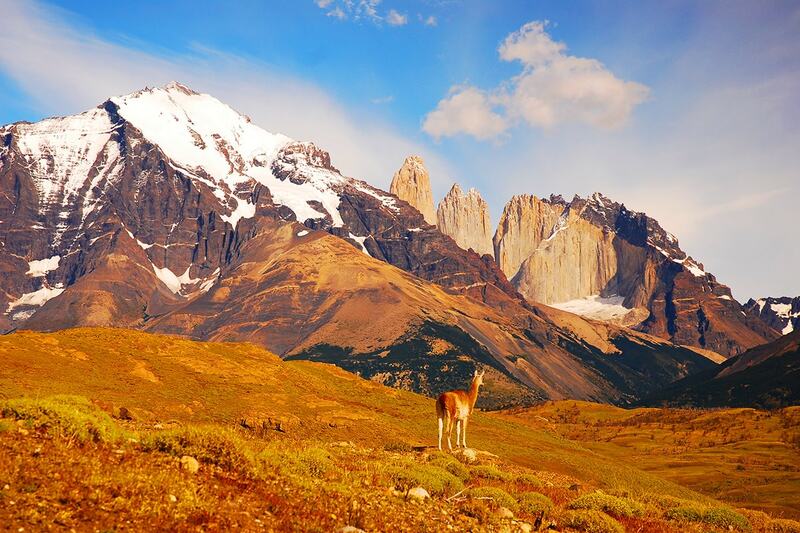 Patagonia’s mountains and glaciers are a visual spectacle to behold! Located on South America’s southern frontier, Patagonia’s vast space, never-ending landscapes and breath-taking rivers is a must-see destination. 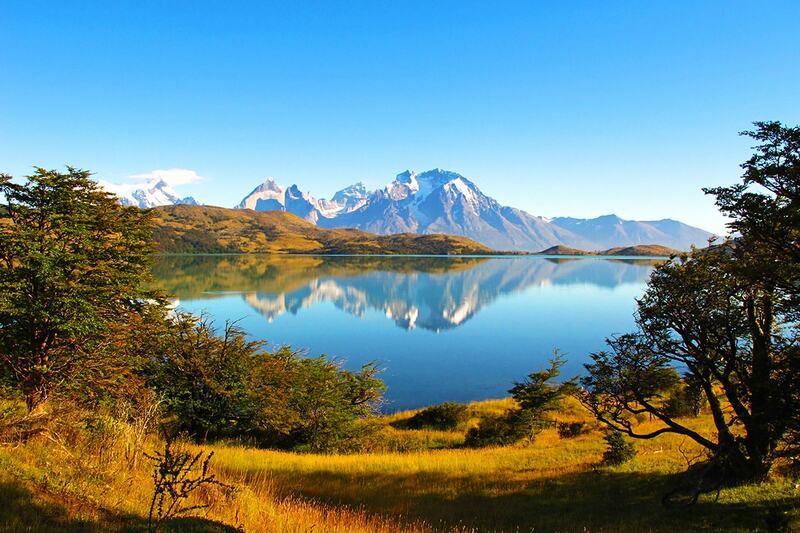 Discover the best best of Patagonia with this 17 day Ultimate Patagonia tour from Santiago. Explore Torres del Paine National Park, see the three sister towers and admire magical views of the French Valley and Cerro Hoja. Enjoy the beauty of Pehoé Lake, hike along Gray’s Glacier, see the northern face of Mt Fitz Roy and Laguna Torre, plus so much more! See What You Get for more. Upon your arrival to Santiago’s international airport, a OneSeed staff member will be there to greet you and take you to your accommodation at a bed and breakfast, located within walking distance from La Moneda, Chile’s Presidential Palace. Please note, some flights may depart one day before. 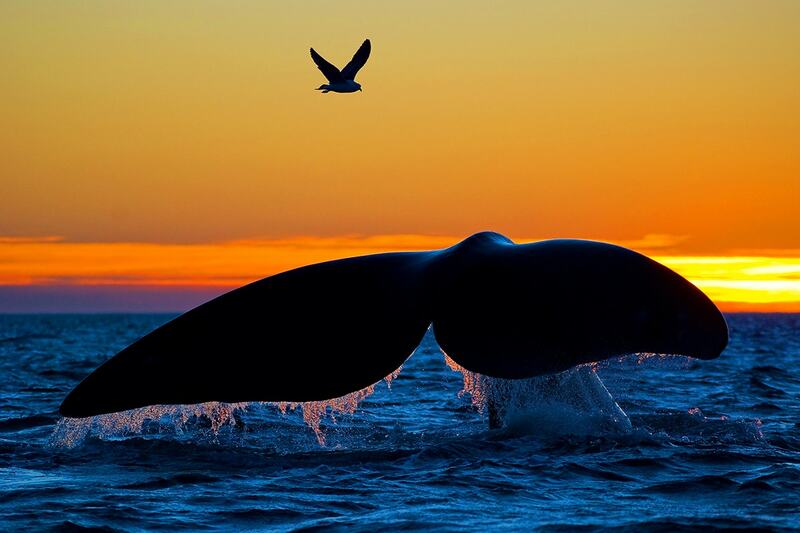 Wake up early for a pre-dawn flight to Chilean Patagonia. After a 3.5 hour flight, meet your local trekking guide in Punta Arenas, who will then accompany you to Puerto Natales (approx. 3 hours bus ride). 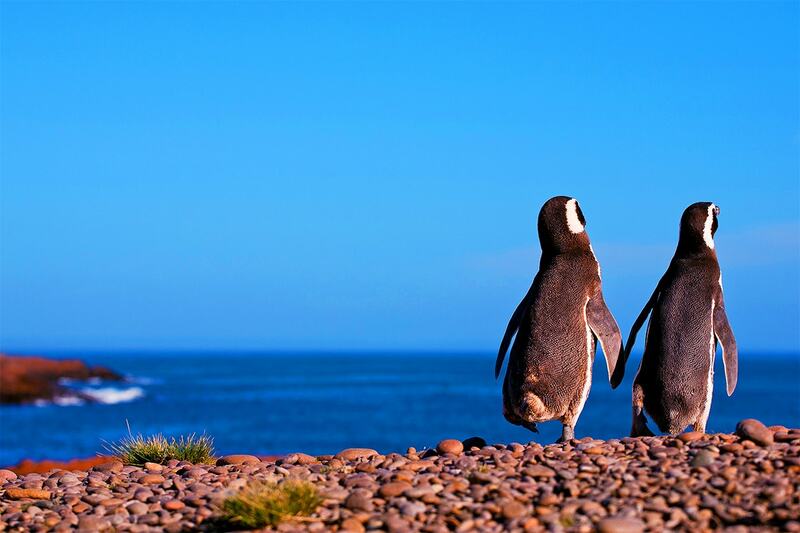 On the way to Puerto Natales, soak up the beautiful views of the ocean surrounded by snow-capped peaks. On arrival in Puerto Natales spend some time exploring this quaint mountain town. Head to the Cueva del Milodón, a famous cave located just outside of Puerto Natales, home to fossils of pre-historic animals and signs of human habitation as early as 6000 BC. Afterwards, enjoy a picnic with local Chilean wine before heading to the entrance gates of Torres del Paine and settling into Refugio Las Torres for the evening. Start the trek with day packs as you ascend through a rocky terrain cut by pristine glacial rivers. Climb through a beautiful lenga forest until reaching the base of the towers. Another shorter climb will put you meters from the three sister towers and the emerald lake that sits at their base. Return to the mountain lodge for the evening. Total distance: 20km. Approximately 8 hours of trekking. On today’s trek you’re only required to carry a day pack. 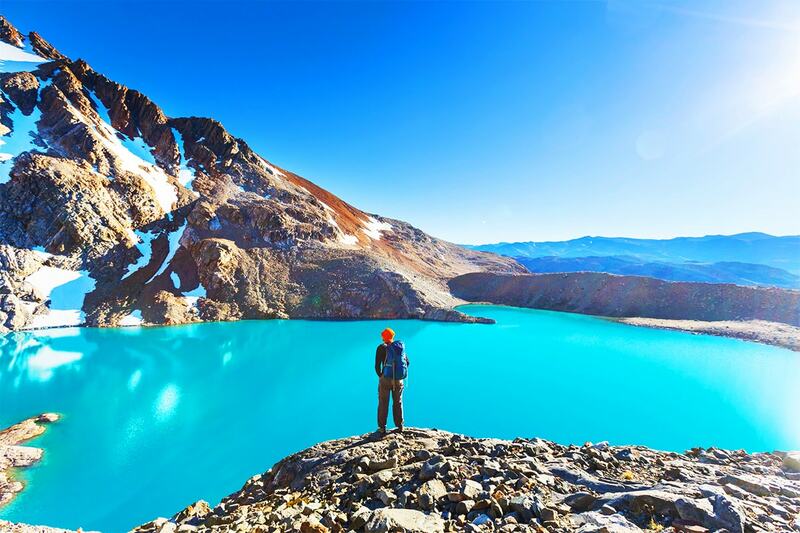 Spend the majority of this part of the trek nestled on a trail between Lake Nordenskjold and Mount Almirante Nieto of the Paine Massif. Total distance: 11 km. Approximately 7-8 hours of trekking. Head out from Los Cuernos and hike through Torres’ old-growth forest. After a short climb, see an impressive viewpoint of the French Valley and Cerro Hoja and Cerro Máscara, two of the famous horned peaks. Total distance: 15km. Approximately 7-8 hours of trekking. Hike to Grey’s Glacier, an impressive ice field that covers the west end of the park. Enjoy the beauty of Pehoé Lake and Grey Lake as you approach the glacier. Total distance: 11 km. Approximately 4-5 hours of trekking. 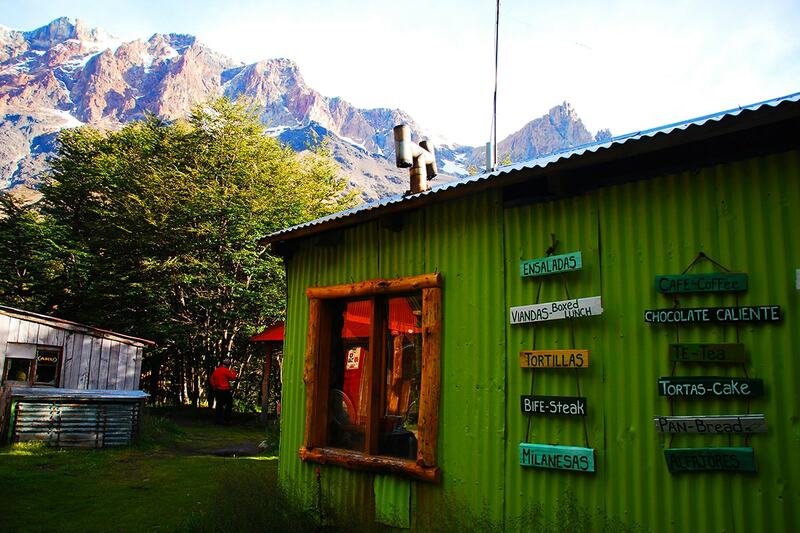 On the final day of trekking, make your way along Grey’s Glacier toward Campamento Paso. Scale ladders and enjoy views of the glacier before returning to the lodge for dinner. Total distance: 10—11 km. Approximately 6-8 hours of trekking. On today’s trek you’re only required to carry a day pack. Spend one final half day in the park. A short three hour walk toward the lake will take you to the catamaran back to Pehoé and out of the park. Bus transportation will be awaiting your arrival to take the scenic ride back to Puerto Natales. Share a farewell to Chile dinner with your guide before a restful night in the lodge. Total distance: 11 km. Approximately 4-5 hours trekking. Take a bus from Puerto Natales to Calafate (approx. 5 hours). Travel overland to El Chaltén, where you will meet your Argentina guide. Settle in and prepare to begin your trek the next morning. Take a bus from Calafate to Chaltén (approx. 3 hours). On arrival, private transport will take you from the Chaltén bus station to your hotel where you will meet your Argentina guide and have a quick debrief on the days to come! 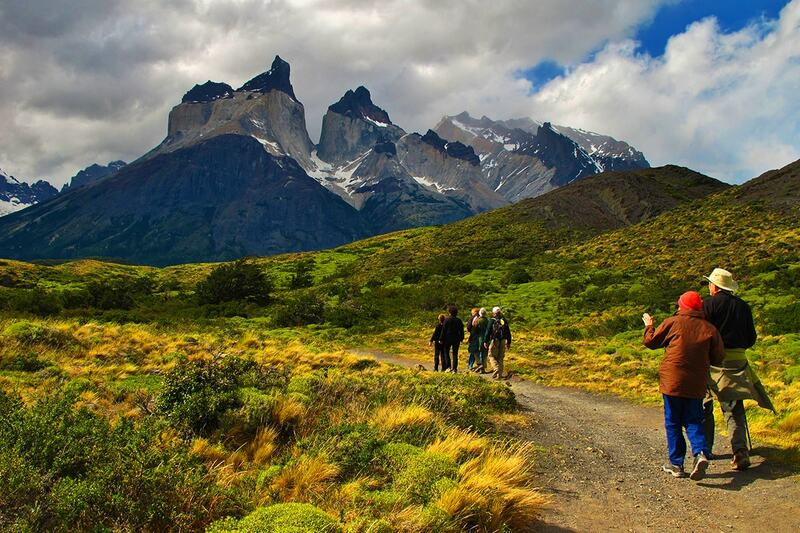 Enjoy a day-hike outside of Chaltén. Total distance: 5 km. Approximately 3 hours of trekking. The day starts with a 30-minute transfer from El Chaltén to Río Electrico. From here, begin walking along the Electrico valley, through an enchanting lenga forest before arriving at Piedra del Fraile, your home for the night. After a short break and some lunch, continue along the valley towards the Pollone Glacier and admire the northern face of Mt Fitz Roy. After a short break at this hidden lagoon, return to the mountain lodge in Piedra del Fraile to enjoy a hot meal and rest. Total distance: 18 km. Approximately 7-8 hours of trekking. After breakfast, head off towards the Piedras Blancas glacier and river. The path ascends steeply up to Laguna de Los Tres, the closest you can get to Fitz Roy before needing technical skills. At the top, enjoy breathtaking views of Mt. Fitz Roy, its satellite mountains, and the valley through which you have come. Weather permitting, have lunch at the lagoon before starting the descent towards Poincenot, your next camp. Be prepared to take more pictures of this stunning spot in the park! Total distance: 19 km. Approximately 6 hours of trekking. Arise early to take sunrise photos of Mt. 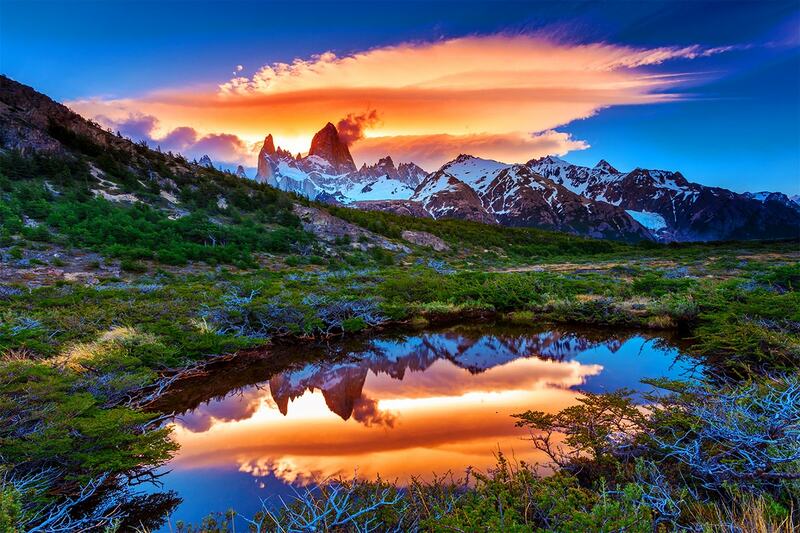 Fitz Roy in a beautiful hue of red, reflected on Laguna Poincenot. After breakfast, continue through the beautiful lenga forests past the lagoons – Madre, Hija and Nieta. The path is quite flat, which is a nice break after the climbing of the day before! After a couple of hours, drop into the glacial valley that takes you towards Laguna Torre (2,136ft/651m). This valley is loved by geologists and photographers for its perfect “U” shape. At the end of the valley, see Laguna Torre, its glacier and the famous Mt. Torre, which is considered one of the most difficult mountains in the world to climb. After lunch at the lagoon, head back towards El Calafate along the Fitz Roy River valley. Take a 2-hour bus ride to Perito Moreno where you’ll have the day to explore the stunning Perito Moreno Glacier. The 97 square mile glacier stretches for as far as the eye can see and you will be awe-inspired by the expansiveness of the blue ice. Take the airport shuttle for your return flight to Australia. Arrive home today. Please note, some flights may arrive home one day later. You will be contacted after submitting your booking form to pay this single supplement. Bookings may be cancelled with a full refund of the deposit provided the cancellation occurs strictly within 48 hours from the time of purchase. All cancellation requests must be made in writing inside of this period to qualify for the refund request. Otherwise, deals purchased from Webjet Exclusives after the 48-hour period has surpassed are strictly non-refundable, non-changeable and non-transferable. If the Business does not have availability to redeem your voucher because you have not attempted to make a booking within a reasonable period of time or by the Book By Date advised on the deal page. Please note, some flight may depart 1 day before and return home 1 day after. Peak season surcharges may apply. Please refer to the availability calendar. Please Note – some departure dates not available out of all states. A flat fee of $350.00 per person is applied per person should you wish to arrive early and/or extend your stay. Fee is non-negotiable and must be paid before your flight variation can be confirmed. A flat fee of $350.00 per person, plus additional airfare and taxes will be quoted if choosing to upgrade your flights to another cabin class. Your quote will not be provided immediately and will be processed in departure date order. A flat fee of $350.00 per person, plus additional airfare and taxes will be quoted if choosing to travel with a premium airline for your tour. Your package is subject to availability at the time of your booking. We advise you to book early to avoid disappointment. 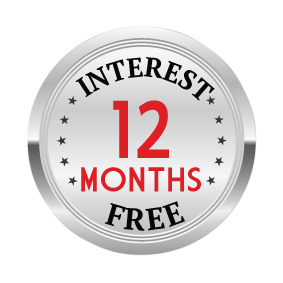 Note: Our 21 Day Money Back Guarantee allows you to claim a full refund any time within 21 days of your purchase – unless of course you have made your booking. If you have made your booking and confirmed your details with our supplier at any time, your purchase will then be non-refundable.